This is a difficult topic for Toula. I expect it is for you, too. On this podcast, Toula talks with Dr. Sebastian Sepulveda, author of a new book, “At Death’s Door: End of Life Stories from the Bedside”. Dr. Sepulveda believes there is a better way to navigate end of life care. He specializes in internal medicine, has 17 years’ experience treating inpatients as a hospitalist. He is passionate about end of life care and helping patients and families to deal with dying. 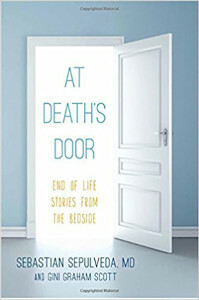 In his book, “At Death’s Door: End of Life Stories from the Bedside”, Dr. Sepulveda shares his firsthand accounts of working with dying patients, exposing a profound lack of acceptance of death even under the most obvious circumstances.